As the owl sat fearlessly on the branch, my husband and I took turns observing it and checking the field guide. It soon became apparent that we were looking at an owl definitely out of its normal range. The Northern Hawk owl (Surnia ulula) is a medium-sized “earless” (no ear tufts), slender owl with a small head and long tail. It has habits that resemble some of the smaller hawks (hence its name). It is a dayhunting owl who perches in open treetops and is tame, with a seeming utter lack of fear. It relies largely on sight to catch its prey. According to Allan W. Echert’s book, The Owls of North America, the Northern Hawk owl is an extremely bold and fearless bird. It can be approached closely without its taking alarm and fleeing – even to the point where at times it has been caught by hand. It seems to have an utter lack of fear where humans are concerned, especially in the more remote sections of its range. Aside from humans, the Northern Hawk owl’s natural enemies are larger owls – especially the Horned owls. Martens, fishers and weasels also kill a certain number of fledgling birds, although the parent bird will usually attack without hesitation any disturbance to the nest. Nest sites for the Northern Hawk owl are most often in tree cavities formerly used by Northern Flickers or Pileated Woodpeckers, tops or hollows of tree stumps, and even in old nests of raptors or crows. It nests between April and late June with clutch sizes of 3 – 9 eggs. Incubation is 25 – 30 days. The young fledge at 25 – 35 days of age and remain near the nest for about two months. They are considered fully independent at three months of age and are sexually mature at one year of age. 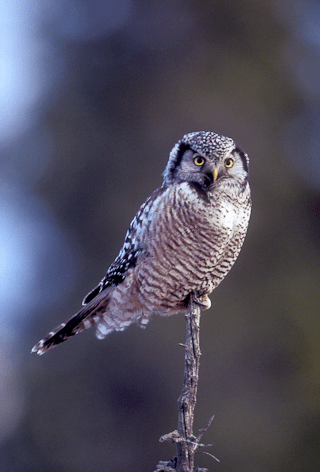 So, what exactly was the Northern Hawk owl doing in Glacier National Park during the winter of 2006? According to The Sibley Guide to Bird Life and Behavior, the Northern Hawk owl is mainly a permanent resident of the boreal forest which extends across the continent from Alaska to the Canadian Maritime Provinces. It usually inhabits open forests with easy access to clearings. It may be found at the edge of a burn or open area, which is where my husband and I saw this owl. When in mountainous areas, Northern Hawk owls may move up as far as 6000 feet in elevation. It tends to avoid dense coniferous forests and prefers more open woodlands, including birch, aspen, and with a preference for pines. But irruptions can occur. Irruptions are often thought to be related to a shortage of available prey, especially lemmings and voles. Other factors include snow cover and crust characteristics, and temperature. Following irruptions, some owls are known to remain and breed in areas far from their previous nesting sites. This brings me back to my “lucky day” in February 2006. I have not had the good fortune to observe a Northern Hawk owl since, but I can assure you I will definitely know what I’m looking at, if by chance, I again come upon this very special owl.